Mix the spaghetti sauce, tomato sauce, diced tomatoes, garlic, various Italian spices, and about a cup of water in a saucepan on low heat. In a separate pan, brown the ground beef and drain off the excess fat. Bake in your 350 degree oven for 45 minutes. With all the different prepared raviolis you can really customize this to your own taste. I am going to have to stop reading these recipes, it?s only 8:50 AM and I am already ready starting to look for food! 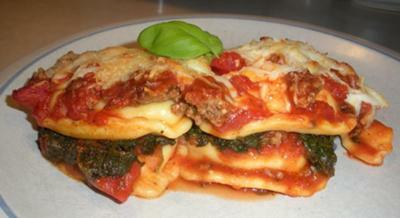 This recipe really caught my eye, I think I will seek some Ravioli Lasagna for today?s lunch.